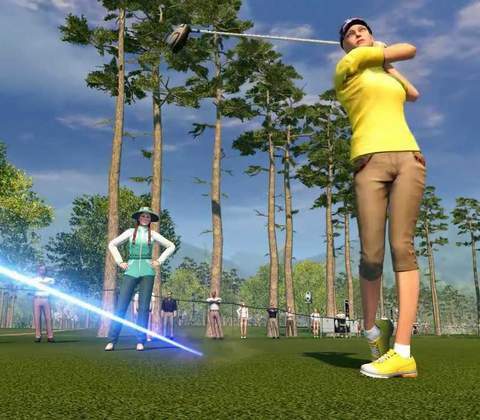 3D Golf Simulator MMO - Winning Putt is a game that combines RPG elements (like gear customization) with the standard gameplay you'd expect from a golf game. It features PVP tournaments and a mix of arcade and simulative approach. 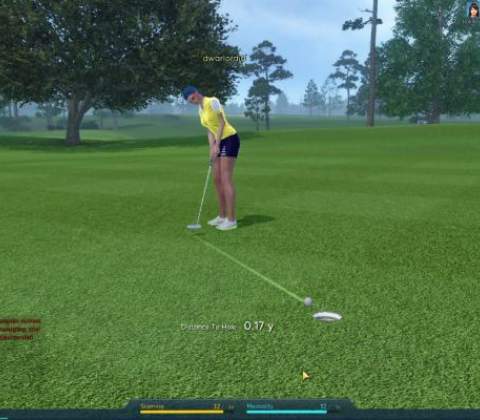 In Winning Putt, just like in real-life golf, players strike a stationary ball with a club, aiming to hit it into holes on the course having as few hits, or strokes, as possible. A round of golf traditionally features 18 holes played on each course, which include different terrain variations to progressively increase the difficulty, such as varying levels of grass and obstacles like water and sand. The more obstacles you avoid, the smaller the score you'll get. 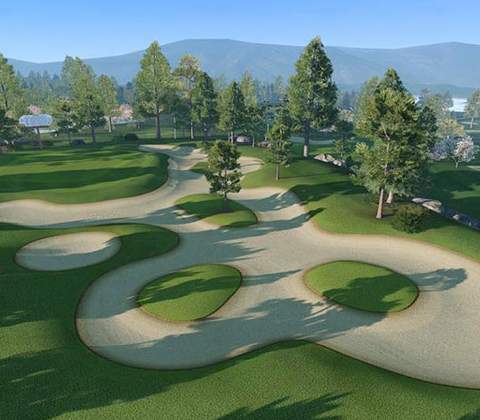 Winning Putt offers seven different courses meant to be unlocked one by one as the player gains fame and notoriety. 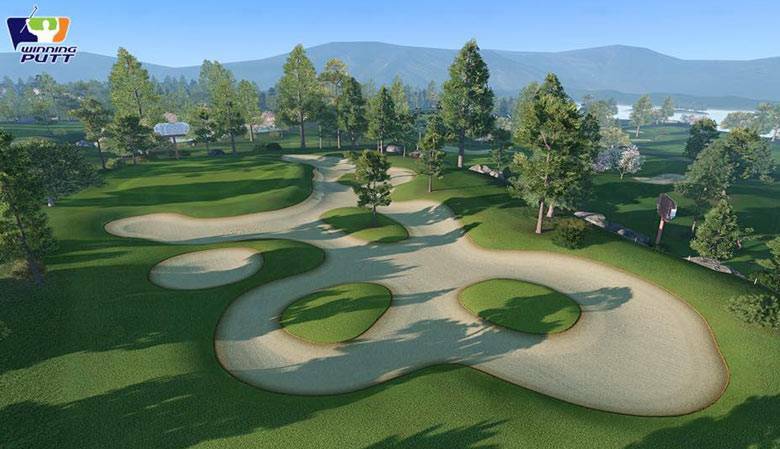 Since the point in golf is to obtain the lowest score possible, the main obstacles that could make you increase your score include rough terrains, small lakes and riverbeds, shallow pits with raised barriers and filled with sand, trees and bushes, and varying intensities of wind. Newcomers can get started on their own in Practice Ranges, or with other players invited by them for some Friendly Rounds. Once players reach level 5, they'll start gaining a training point each time they level up. Training itself can be accessed through the management by paying the training fees. After reaching level 10, Ranked Rounds become unlocked so players can climb their way until they reach the Junior Pro league and take the qualifying test that unlocks the PVP Challenge Rounds. Winning Putt Tournaments are unlocked after passing the Semi-Pro qualifying test. Two more challenging variations of the latter rounds become available when players reach levels 18 and 20 respectively: PVP Betting Rounds are just like the Challenge Rounds but also allow you to bet against your opponent, while occasional Winning Putt Tournaments are unlocked after passing the Semi-Pro qualifying test and purchasing the entry fee. Your final score is measured in "strokes": the number of times you had to hit the ball. At the end of each hole, the players' score is compared with the default number of strokes it should have taken them to finish it. If the ball lands out of bounds or in the water, the player will have to take another swing and will earn one stroke for each. Players can earn varying amounts of gold and experience points according to their performance in each round, besides the completion of missions. Gold can be used to train and boost statistics, purchase gear, or customize the character's appearance, while experience gain will make you level up and allow you to unlock different skills, courses, and additional gameplay modes. Platinum, Winning Putt's premium currency, can only be purchased with real money. Players can choose classes between Power, Accuracy, and Balance. After customizing your character's appearance, you'll be able to choose their Class, which will help you determine what your character does best when playing golf. The Power Class will allow you to hit the ball harder and farther so it can reach the hole with the fewest number of strokes, while the Accuracy Class makes your character able to hit the ball exactly where you may want it to go every time, which could be tricky if they have to play holes at a longer distance, in which case they'd have to find shortcuts to save some strokes. In case you're looking for a little bit of both classes without prefering one over the other, you can also choose the additional Balance Class. - Stamina and Mentality affect the character's respective pools. - Accuracy determines how wide the sweet spot of the hit can be. - Rough provides bonuses when hitting the ball on rough terrains. - Bunker provides bonuses when hitting the ball inside a sand or water bunker. Stamina and Mentality, in particular, are used on each swing and consumed at a faster rate when using skills. If their pools are too low, it will become increasingly difficult to make shots as you plan them. Even clothes can improve your character's performance. To play golf, you'll need a set of clubs, some golf balls, and a golf bag to carry all of them along with consumables that will grant you temporary bonuses. - Swing, which affects how far the ball can be hit. - Forgiveness, which affects the accuracy of the club when it hits the ball. - Swing Bar Deceleration, which lowers the speed of the swing bar, making it easier to hit the sweet spot. - Sweet Spot Accuracy, which increases how wide the sweet spot can be. 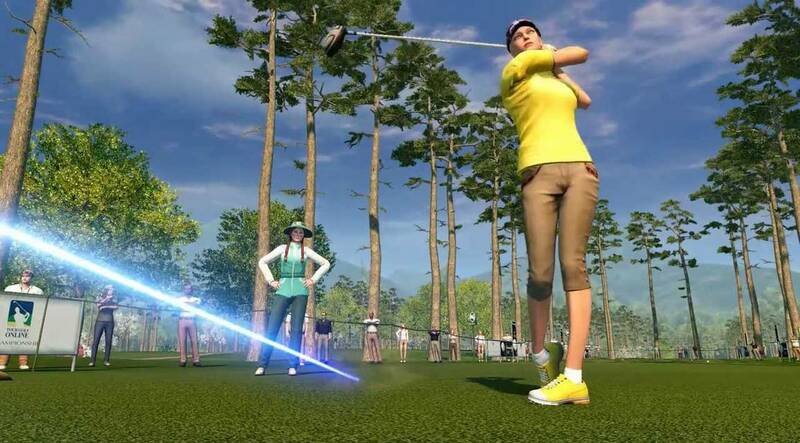 Players start with a set of basic starter golf clubs, but they can earn new ones by completing certain missions or purchasing them from vendors. They will also grow progressively damaged, but they can be repaired at the repair shop or on the golf course itself (which is more expensive). Keeping them unrepaired, of course, will make the gameplay far more difficult than it should be. The initial golf bag has only one slot to carry an extra non-essential equipment, which can range from special golf balls, snacks, drinks, or technology (such as a putting guide or advanced GPS system). Purchasing better golf bags every now and then will allow you to carry more specialized equipment. Basic golf balls are always available for free, so you'll never run out of them. However, you can purchase other variants from the vendors: some only have different colors or different graphical effects, while others will increase the character's power or accuracy. Once carried in the golf bag, they'll be equipped automatically. Keeping a snack or drink in the golf bag will allow you to take a break to consume them and boost your skills whenever you need it. They can be used to increase the power for a shot, or to revitalize your Mentality and Stamina. Equipping a specialized technology in your golf bag, such as advanced GPS systems, will grant you special bonuses. Like most gear, they're available for purchase and are useful to provide further information about the terrain surrounding a hole, or even give a special putting guide that can help you tell precisely what line the ball will follow. The clothes and accessories can also be made to not only fit your own style preferences, but also to improve your score. All gear can be customized to have their statistics improved at the fitting and enchanting shops. Additionally, a default caddie will provide helpful information and advice during the round, though you can also contract special ones who may provide additional services, such as discounted club repairs, better terrain information, and even extra skill slots. Promising as Winning Putt is, especially because it's published by Bandai Namco and based on CryEngine, it's still inexcusably lacking a more complex development and much-needed server support that can hold more players than it already does. On top of that, the technical support team and Winning Putt's representatives rarely provide any actually useful assistance to the few users they have, neither through their forums nor through their official social media channels. One of the most persistent requests is that they expand support to Apple systems and make the server a bit more stable, which hasn't happened yet. Winning Putt has potential, but it definitely won't develop on its own. Ready to enter the world of Winning Putt? Click here to play now! Besides each of the characters' own skills, their success (or failure) also depends on environmental factors such as the wind's direction and the ground slope, apart from specific gear such as their clubs.